But it’s hard to reach our potential for excellence when we are so busy trying to stay current that there is no time to focus on the big picture. As we scurry through back-to-back meetings, fend off constant “emergency” interruptions, and scramble to react to change, we also lose our ability to respond with clarity, creativity and compassion. 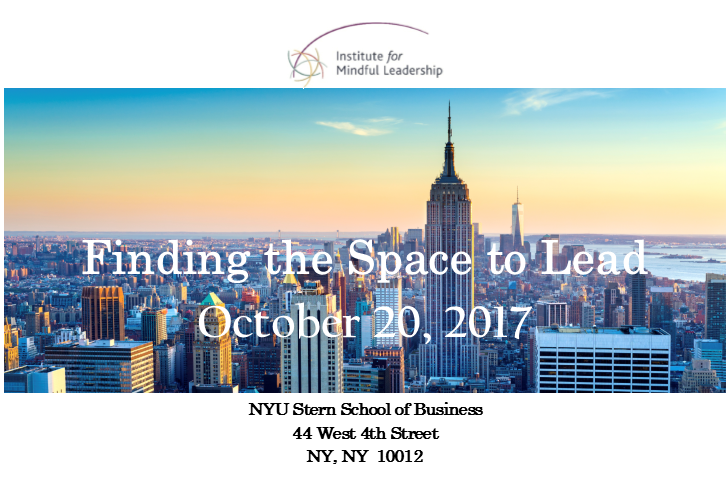 In this daylong workshop at the NYU Stern School of Business, you will learn to cultivate the innate abilities of your mind, and approach everyday situations with greater authenticity and focus. The Institute’s day long training has been successfully used with organizations around the world for more than a decade. Using the curricula described in Janice Marturano’ s international best-selling book, Finding the Space to Lead, you will leave the workshop with the tools to help you incorporate mindful leadership training at work, at home, and in every aspect of life. After taking this workshop all participants will be invited to attend our free monthly online Alumni Sessions where we will continue to explore the philosophy and practices of mindful meditation.